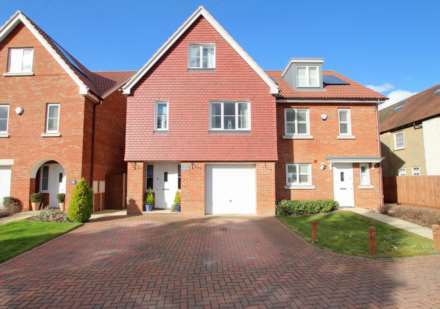 Spacious 4 Bed semi detached home constructed around five years ago in this sought after modern development. Ensuite Shower Room to Master Bedroom. Family Bathroom. Sitting Room. Spacious Kitchen/Dining Room. Downstairs Cloakroom. Integral Garage. Further off road parking.60` Approx Rear Garden. Refurbished 4 Double Bed 2 Bathroom Semi-Detached family home. Luxuriously refitted Kitchen/Breakfast Room, wardrobe to the Master Bedroom. Lounge. Kitchen Breakfast Room with integrated appliances. Conservatory / Dining / Family area. Bathroom. Refitted second floor Shower Room. Driveway. Garden. Extended 3 Bed semi detached home located on this private road in this sought after development. Convenient for shops, schools, & Green Line Service to London. Lounge with feature fire. Dining Room. Kitchen Breakfast Room. Study. Cloakroom. Bathroom. Extensive off road parking. Approx. 100` Garden.